Judge: "Will the defendant please rise?" 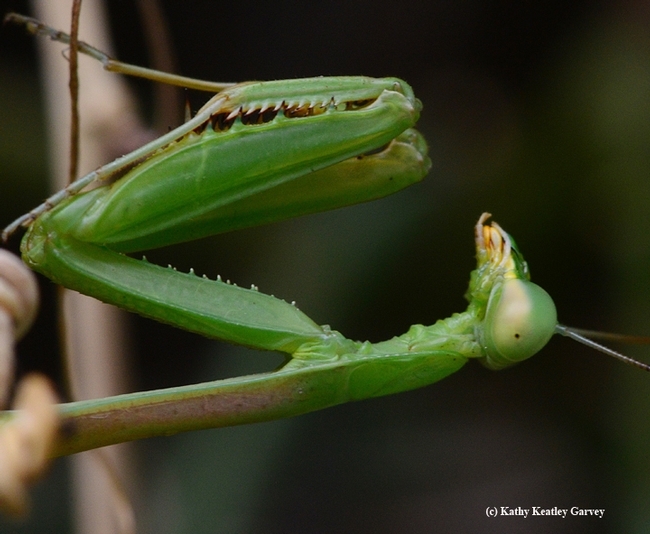 The defendant, a praying mantis--a male Stragmomantis limbata--rises solemnly, stretching his spiked forelegs. 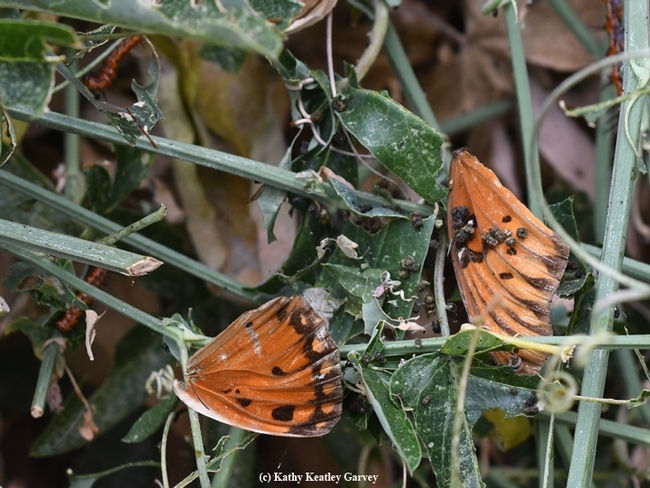 Judge: "Do you have anything to say for yourself about how this dismembered Gulf Fritillary butterfly, Agraulis vanillae, happened to be in the very same passionflower vine that you were occupying--at the very same time, 4 p.m., Sept. 12, 2018 in Vacaville, Calif.? Do you have anything to say for yourself, Mr. Mantis?" Defendant: "Yes, sir! I do, sir. I was hungry. But I ate only the abdomen, thorax and head. I left the pretty parts, the wings, behind, for everyone to enjoy." Mystery solved. Everybody eats in the pollinator garden! 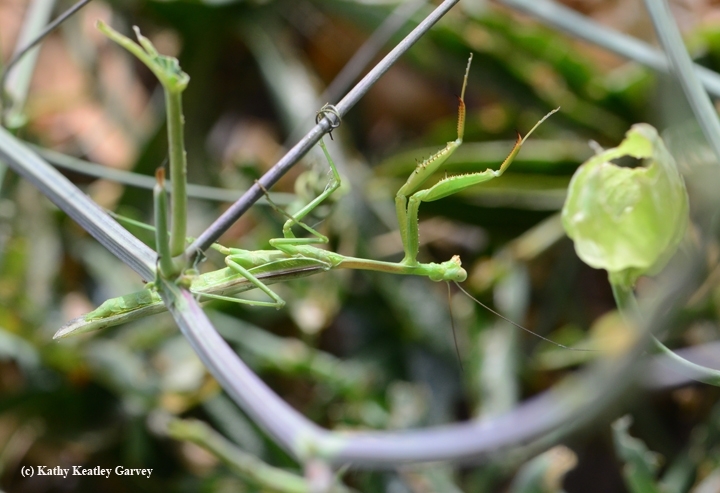 The male Stagmomomantis limbata, as identified by mantis expert and Bohart Museum of Entomology associate Lohit Garikipati, a UC Davis entomology major who rears mantids, proved difficult to see amid the green passionflower vine (Passiflora). A perfect camouflage! It's a male Stagmomomantis limbata and not a male Mantis religiosa? "Note the bicolored pronotum (first thoracic segment) that is an easy distinguishing tool!" Garikipata said. "Mantis religiosa also have a band around the head!" S. limbata, commonly called a "bordered mantis," is native to North America. It is green or beige and can reach three inches in length. 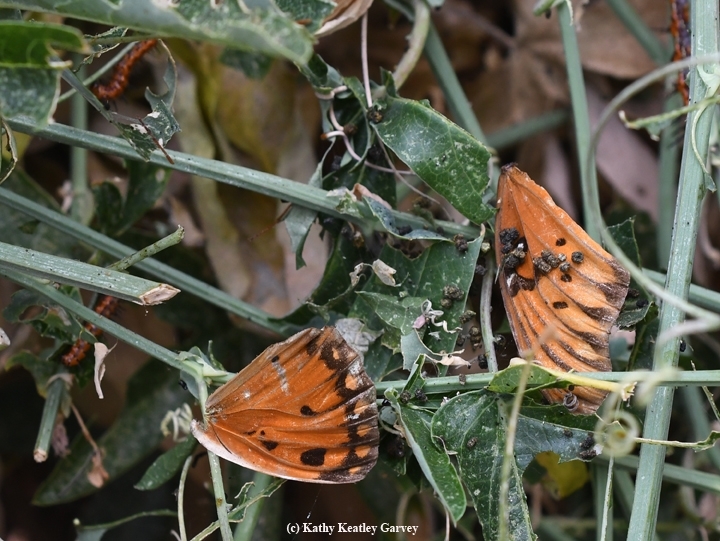 "Males are slender, long-winged, and variable in color, but most often green and brown with the sides of the folded tegmina green and top brownish (may be solid gray, brown, green, or any combination of these)," according to Wikipedia. "Abdomen without prominent dark spots on top. The wings are transparent, usually with cloudy brownish spots on outer half." Garikipata described it as a "super cool find, adult males are superb fliers!" This one didn't fly. At least then. 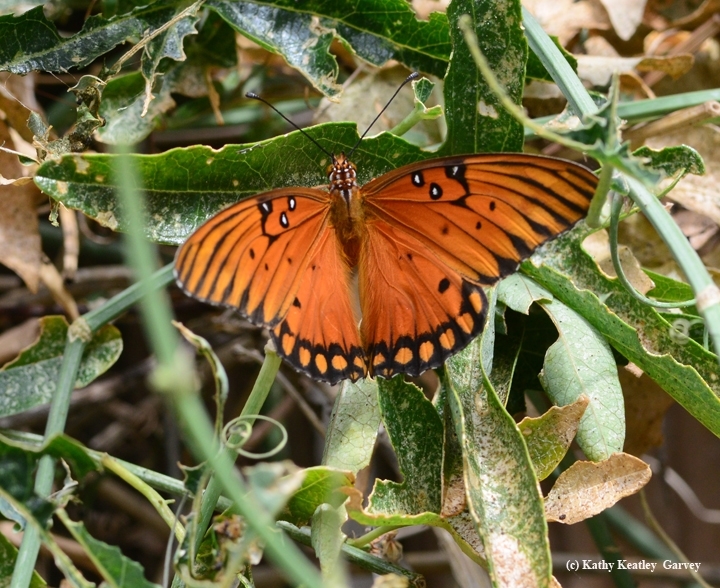 Neither did his prey, the hapless Gulf Fritillary.